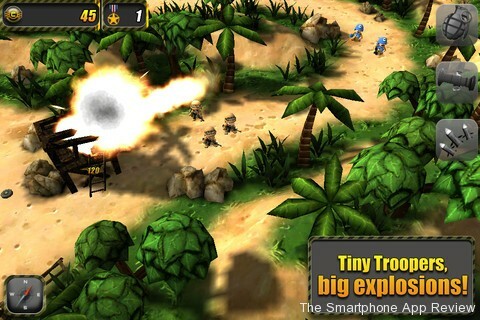 Cannon Fodder for iPhone, now that is something we would all like to see. The Sensible Software classic still remains one of the most original and fun games ever released for the now ancient Amiga platform, but while we await a re-release or updating for iPhone, Chillingo have created Tiny Troopers, a game that it hopes will fill the need for a new Cannon Fodder. 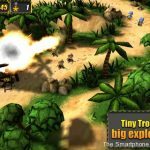 Tiny Troopers, while not entirely successful in many areas, is at the very least a proof of concept that a reworked Cannon Fodder could work with touch screen controls. 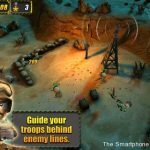 The game is very obviously inspired by the classic series, with you taking control of a troop of tiny soldiers sent into various war zones. 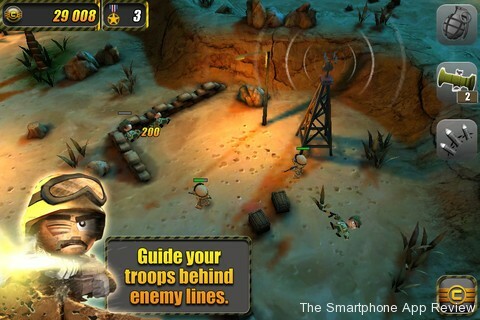 The action, in full 3D, is viewed from an isometric style viewpoint, and tapping anywhere on the screen will cause your troops to walk to that point in the level. The screen tapping is context sensitive, so tapping an enemy will cause your soldiers to fire on him, which means it is easy to fire on someone while keeping your troops on the move. 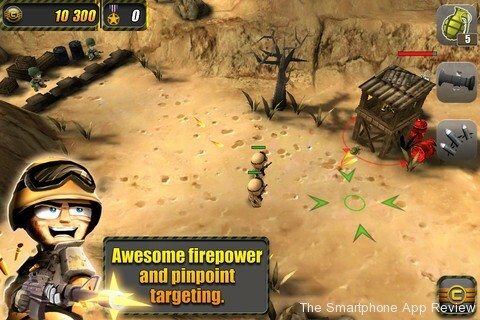 Indeed, moving and shooting at the same time is the key to defeating nearly all the opponents in the game. You can collect grenades and rockets, which are activated by dragging your finger from the icon to the point on the screen where you want to deploy the weapon. Overall, the basic controls work superbly, and are the main basis for my claim that a Cannon Fodder game could work just fine on iOS. Unfortunately, some odd design decisions hold the game back, with one niggle in particular limiting the game spectacularly. The camera. This type of game is, of course action orientated, but there has to be an element of strategy, after all why have a Cannon Fodder game if you can’t plan attacks on your enemies in that classic, ‘off the cuff’ stlye? The problem is that the camera is far, far too zoomed in, so you get very little warning of enemy attacks, much less of their starting positions and base layouts. You literallly just blast enemies as they run from the edge of the screen, so there are no planned attacks, no sneaking up on enemy encampments and no setting impromtu traps and ambushes. If things were just elevated by 50%, you could get a far better view of the battlefield. There is a map screen, but it only shows you the layout of the land and main objectives, unless you spend some hard earned Command Points on upgrading it. The camera is also slow to react to sudden changes in movements, to such an extent that you can find yourself travelling stright towards the edge of the screen, able to only see a few millimetres in front of you. Those Command Points I mentioned are another problem. You earn them in missions by finding dog tags and performing well, and they can also be bought via an IAP, not a problem in itself, but each time you spend them on an upgrade, it is only for the next try at a mission, so you can get a guy with loads of grenades at the start of the mission, but he will not be there after that mission is either completed or failed, meaning that you have to dip into your Command Points again. 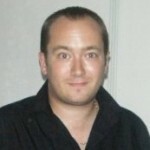 You do get a lot of Command Points in-game, but the main problem will be for players who are not very good at the game, as a vicious circle can soon develop. Keep getting killed on a mission? Spend some points on various upgrades, then finish the mission. Problem is, poor players will have to keep doing this to proceed, and if they are not very good at the game they will most likely not be earning very many points naturally, meaning the IAP’s become more and more necessary. These Command Points actually spoil the game for good players as well. Good players will no doubt earn loads of them with every mission, but as they also allow you to spawn health packs, grenades and rockets at will, this reduces the difficulty and tension in the game. There are also some silly difficulty spikes that are not helped by the dodgy camera. You can spend ages clearing a level of enemies and buildings, only to walk right into a tank that wipes you out in one shot. I don’t mind there being enemies that can kill your whole squad instantly, but when the only way to know it is coming is learning after being killed by it before, frustration can set in. Also, why have night stages when the enemy can still see you coming from off the screen? Don’t get me wrong, there is a lot to like here. Some levels are very clever, such as the Black Hawk Down stage, the controls are great and the death animations are straight from Cannon Fodder. If they could fix the camera, rethink the Command Points and in-stage difficulty spikes, then this could have been a very good game, instead of feeling like a nice try at a Cannon Fodder game. Next Article Free Promo Codes for iPhone Game LightUp!